How did you gather up the willpower to come back? Amazing photos, looks like one of the most beautiful places on the planet. Just looked up flights, shockingly inexpensive (<$200 round trip for some). 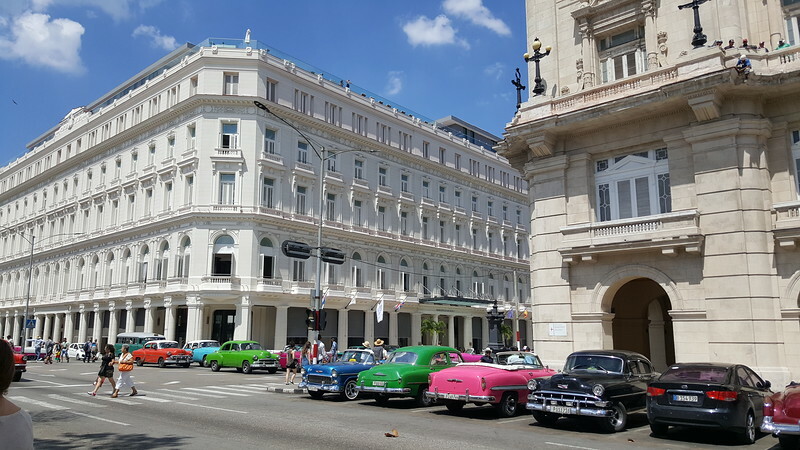 Sounds relatively simple to travel under the "Support For The Cuban People," exception as well, as long as your itinerary involves spending time and money at local businesses and avoiding banned hotels. Did you get any trouble at the airports? Might make this my summer trip. Would LOVE to take in a baseball game at Estadio Latinoamericano. Havana is a beautiful city. It's crazy that it's a one hour flight from sprawly Orlando. Flights are cheap and other than getting a special $50 visa, not really different than flying to any other country. I had a humanitarian visa and took a carry on bag with school supplies and personal items that I donated. The people are nice, it's real safe (guns are banned), the place is completely walkable and the food is great. It's an easy weekend trip, affordable and a shorter flight than traveling to NYC, DC, Chicago, Houston, etc. I'd love to go to Havana. I can remember an uncle who used to visit in the 50s. Back then it was a close spot to go enjoy the nightlife, sow some wild oats, and gamble. I had to laugh (or cry) about the low violent crime rate. First of all, communist/dictator-type states rarely publish honest statistics. Secondly, the state commits violent crimes against anyone who dares to protest against their form of government. We are far from perfect, but at least one can protest our government's actions without fear of being hauled away and jailed. ^I assume that's why the crime rate may be what it is. The punishment is a lot stiffer. Yeah, I did a week there in 2015. A truly phenomenal city but such a crying shame how they have completely screwed it up. The photos give a very distorted view. They are definitely real, they are definitely beautiful (as are the women; Sweet Jesus!) but they are a severe minority. Much of the city looks like a dilapidated movie set -- private restaurants seriously set up in buildings one-third to one-half usable in a setting that appears war-torn fake. But its real. Ration books for monthly food allowances, one currency for visitors and another for Cubans, etc. And to take a cruise around town in one of those vintage American cars? Incredible. Hopefully regime change occurs soon and that nation can move forward. Rarely is the praise heaped on certain sectors of the Cuban experience quite what its cracked up to be (health care, etc.). And they have Stasi-like informers on practically every block. I was blown away by the historic city cemetery. As someone who tries to appreciate history, it is there where you really come to terms with just how rich this city was -- and the very clear fact that 1959 Miami was nothing remotely close to 1959 Havana. I’d also seriously challenge the idea that “crime” is low. Violent crime may be low, but there’s also an illegal black market that almost everyone participates in, because they can’t get by on government rations. The photos are representative of Old Havana. It's where much of the recent redevelopment focus has been. However, Havana is a pretty big city with +2.1 million residents as of 2012. It would be larger is the government didn't control the movement of people to it. I plan to revisit and explore more of the areas outside of it. I'm especially interested in Barrio Chino, the cemetery you mentioned, El Vedado and Nuevo Vedado. I did walk through a few areas outside of Old Havana. As mentioned, you get a good feel of how grand the city was in its heyday. You also see what a place looks like when it doesn't demolish anything despite the economy not being able to support what it once was. You see ration lines and businesses operating in parts of buildings that collapsed years ago. It reminds me of a larger, denser Detroit that hasn't experienced Devil's Night. Let me clarify. I'd argue you have a better chance of getting mugged on the street in Jax than you do in Havana. As I said: violent crime may be low, but that doesn't mean that crime is nonexistent there. Especially considering what qualifies as a "crime" in Cuba.